This article discusses how many times a week to do subjects and how far in advance to plan on a weekly planner. The ideas presented here are meant for homeschoolers with young children [K-6]. My suggestions in the following article are rather general, but based on my experience. The answer of how many times per week per subject or how far you should plan a subject depends on the goals that you have for your children, what sort of books you are using, and how often you believe will be best for the work at hand. If what I just said makes no sense to you then please view the image that is on the left. Click the image to see a larger version. The image shows an example of transferring plans from a subject form to a weekly form. In a weekly planner, some subjects shouldn't be scheduled too far in advance. Math, for one, should not be planned too far in advance. Fortunately, there's no problem with scheduling math, because almost all math curriculum is laid out for you. If your child did lesson one yesterday, then today your child will do lesson two, unless your child had a problem with lesson one! This is why you should not schedule math far in advance! One never knows ahead of time which day will require some math review instead of a math lesson. If you need to schedule an entire week of math at a time, use a pencil to write the schedule in case you have to erase later. Math Labs: Depending on the complexity of your math lab, you might need to plan ahead of time. Math lab is a hands-on activity that uses objects like beads, Legos, money, or even a trip to the grocery store. The week before math lab day, look over the upcoming week or the previous month in your child's math book to see what skills you can reinforce with hands on activities and make your plan. You can also plan a math lab day that is based on your child's weak areas or even have an extended math lab on money management. Allocate plenty of time for math. In the middle thru upper grades, it could take as much as 2 hours to complete a math lesson. If your children seem to be taking a gross amount of time for math, it could be that they have not memorized the basic math facts. Based on their age or grade, children should instantly know the answers to basic math facts. It is well worth their time to memorize math facts. Mid-term fourth graders shouldn't be adding with their fingers any more, it will slow them down when they are trying to learn how to multiply and divide. Graduating fifth graders should have all four of the basic facts (addition, subtraction, multiplying, and division) memorized. If your fourth grader can't immediately answer 7+ 9 or 17 - 8, then start doing a grade-appropriate fact sheet before every math lesson. However, if you do not want to do the drill sheets, another alternative is to let the children look at either an addition chart or a multiplication chart while they do math lessons. Over time, they will learn the basics this way and they will eventually not need the charts any more. Plan grammar the way you would plan math- a little at a time, perhaps a week or two ahead and in pencil. Some grammar programs are easy to plan. Daily Grams (Daily Grams is not a full grammar program) has 180 lessons. You can take up to two years to complete a Daily Grams book or you can do a lesson a day and complete it in one school year. Easy Grammar takes around two years to complete. 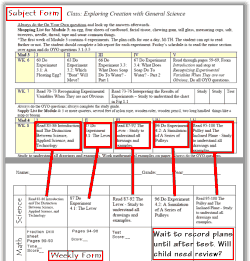 If you are using a curriculum similar to Bob Jones, there should be a teaching plan already laid out for you. You will need to look over the plan and count how many days of the school year that this program will be used. The 8th grade Bob Jones English book is set up for 90 days. That could mean using it every day for a semester or using it every other day for the entire school year. That is something that you will decide before you make your lesson plans. Look through the grammar curriculum that you have chosen and decide how long you believe it will take to complete the program. You must also decide how many days a week that you want to devote to grammar instruction. Write your decisions down for your reference later when you are making your weekly plans. Times a week: Varies depending upon circumstances and age of student, grammar can be done daily or not, it just depends on your goals. Junior-high children (grades 7-9) should work several times a week with grammar in preparation of high school classes. Spelling books are generally laid out for you and all your child will do is a lesson a day for four days and then a test on the 5th day. Times a week: Spelling is typically a daily class in grades 1-6. If you use Natural Speller or Spelling Power, you will need to make plans. You'll need to decide which word list to use and what activities that you want your child to do each day. Once a week you will need to make detailed lesson plans for the upcoming week. I think Spelling Power has the tools you need to teach spelling and it is more structured and Natural Speller has the tools you need to teach spelling, but it is not structured. You have to decide the structure of the lessons and how to go about creating the lessons. If you're interested here is one method of planning Natural Speller: Spelling Planner. Don't forget this! Studying words is a very good use of your child's time. Vocabulary curriculum is available to you that will make vocabulary planning easy for you. Wordly Wise is a common one. However, you can do vocabulary without curriculum. If you have a very good dictionary one that has the parts of speech, the pronunciation, the syllables, the antonyms, the root words, and of course, a definition and example sentence for every part of speech that each word has. Sadly, most dictionaries fail! The giant tomes that come with the World Book Encyclopedia or the Britannica are usually terrific dictionaries. I bought mine used at the public library. I understand that Merriam-Webster dictionaries are good. A thesaurus is also very useful for word study. If you get a small pocket thesaurus, make certain it has (at least) the pronunciation, antonyms, and of course, it will have the synonyms. It would be very nice if it also tells the part of speech for the words, and has example sentences. Make certain the type is readable and not too dark and blurry. An added bonus of non- curricula word study is the dictionary skills that your child will obtain. Children enjoy owning their own thesaurus, so look for nice small ones that you can afford to buy for each child. Dictation is useful for language skills. It incorporates handwriting, spelling, grammar, punctuation, proofreading, listening, and anything else that has to do with language arts. Always use high quality literature for your dictation to expose your child to good examples of writing as well as a higher vocabulary in use. Younger children can look at the book, copy the selection, and then check it for errors. Older children can also start out by copying also, and then later switch to listening as you read the selection a sentence at a time. They will determine from your voice (and eventually their own experience) as to how to punctuate the selection. Dictation is hard and you may encounter heavy-duty complaints from your kids, but it is worth their time. There are writing and grammar lessons that can be done after a dictation lesson. If the selection contains many adjectives, your children can learn what an adjective is and pick out the adjectives along with the nouns that the adjectives describe. Have your child read aloud the selections without the adjectives and then again with the adjectives. Have him compare the two. For creative writing, you could have him substitute some of the adjectives for different ones. You can plan similar activities with nouns and verbs too. If you want to target punctuation, try to pick selections that have plenty of punctuation such as quotation marks and commas. Times a week: Dictation is optional, but if you do it, plan to do dictation as many times as you want each week. If you plan to use dictation to teach grammar, then get a good college grammar reference book such as Harbrace Handbook. Times a week: Everyday. Allow time for your child to do plenty of reading every day. You should also plan to read aloud to your children every day. Also, be certain to listen to your child read aloud because this will give him an opportunity to improve his reading and will give you an opportunity to help him with his pronunciation, tone, and rhythm. If you are using a writing curriculum such as Writing Strands, Easy Writing, Wordsmith, etc. decide how many times a week that you are going to have a writing class and go from there. Don't over schedule writing because some children may need extra days for their lessons. For example, each assignment in Writing Strands is spread out for a certain amount of days. If you plan this program in advance, skip several days between each assignment just in case your child needs extra days. If you plan all of the writing classes in advance, use a pencil and leave plenty of days in between assignments. It may be better to plan one assignment at a time and write the lessons that are completed in your planner as you go. If you are going to design your own writing classes, you can plan one assignment for every two weeks (or longer, depending on the difficulty of the assignment) making up to 16 assignments in all. This plan will give you 4 weeks of flexibility (or 4 weeks off from creative writing). Times a week: Depends on your goals. I recommend that the older the child is the more writing he does. Young children can be encouraged to keep a daily thought journal in which they write at least one thought each day along with the date. When your child is learning the alphabet, it also would be a good idea to teach him how to form the letters. This would amount to a short 5-minute class with no pressures. There are many good handwriting programs. All you have to do is decide which one to use and then stick with it. When all of the short lower case letters are the same height. When all of the upper case letters and tall letters reach the top line (except for t). Go gentle with the criticism; remember, there is a lot of time for your child to practice and become better at handwriting. I recommend short classes. Fifteen minutes should be the maximum.